IMS 2.0 Canon FD Mount for RED Epic / Red Scarlet / Red Dragon / Red Helium / Red Monstro. Note :It does not fit the original early RED One cameras. This mount is ONLY completely mechanical. 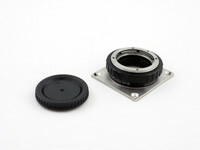 Electronic lenses cannot be controlled with this mount!